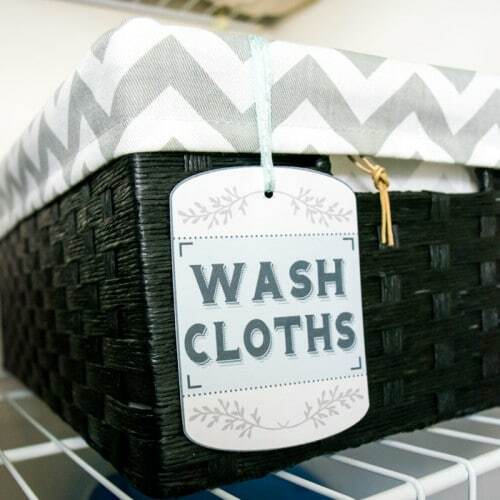 Do you want less clutter and more bathroom storage? We all do! 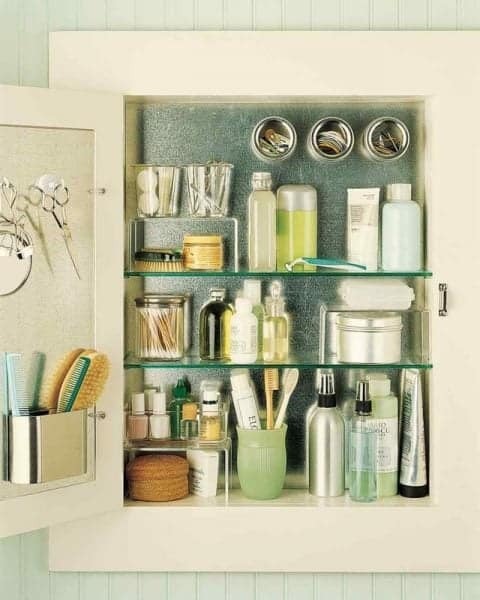 Here are over 20 space saving small bathroom organization ideas. Do you have limited bathroom space? I know how frustrating it can be having a small bathroom and not being able to organize all your things the way you would like. 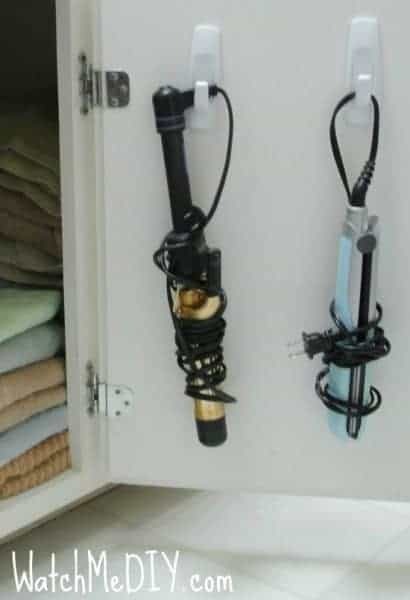 Let’s face it, a lot of our items are needed to be kept in the bathroom, whether we like it or not. I have lived with several tiny bathrooms and one of the best ways I have found is to try to have a vanity area separate from the bathroom if you have another space. However, what if I told you that it’s possible to have a beautiful bathroom and create enough storage space with the small area you have. 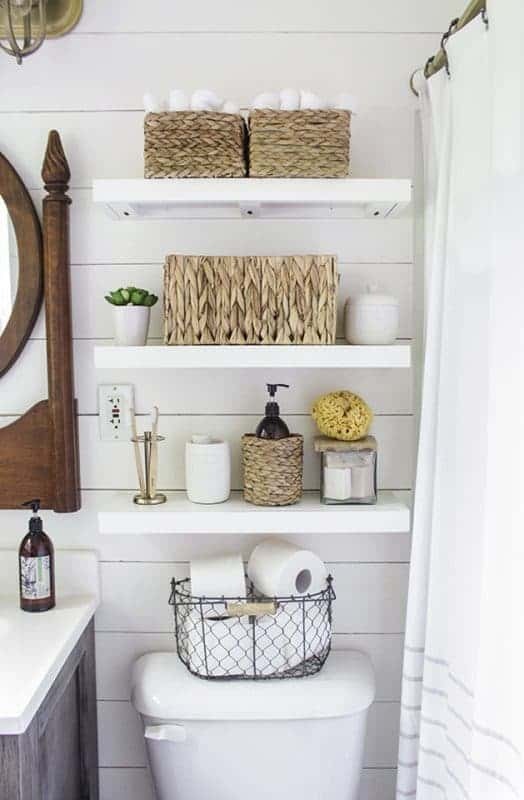 Many bloggers have come up with small bathroom organization ideas and I hope they encourage you to love your small bathroom! 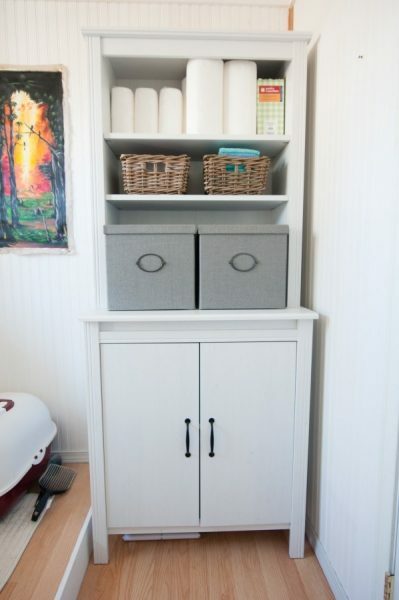 Vertical storage is a must, especially with small counter space. 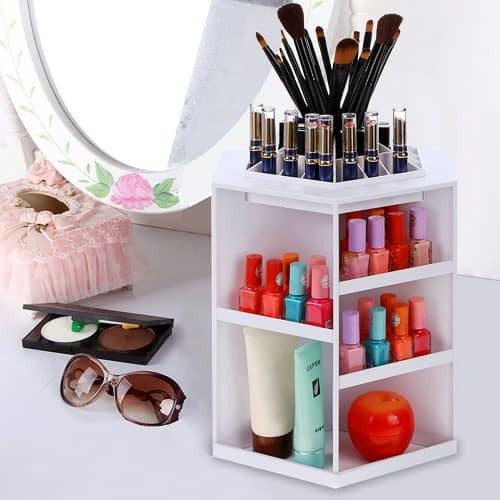 We love this this rotating makeup organizer. How Cool is this? A full length mirror on hinges that opens to reveal plenty of storage. Find it here. 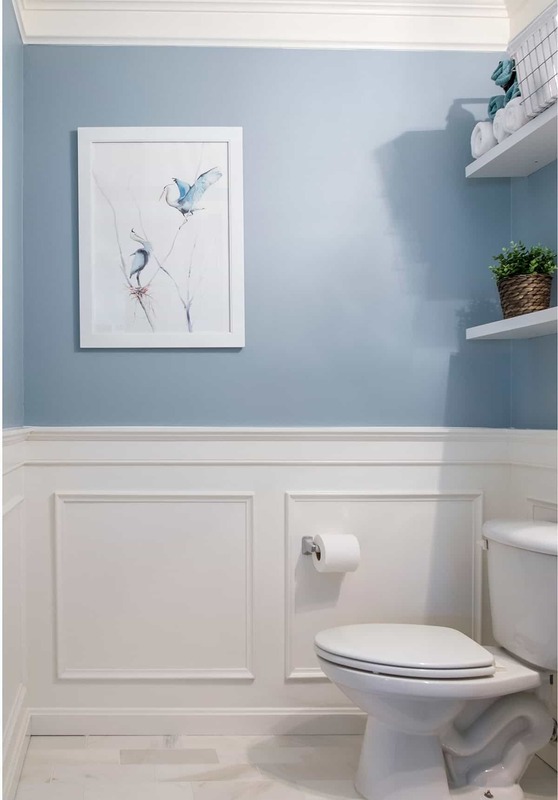 Add Shelves and baskets above the toilet for extra shelving as in this beautiful bathroom. Notice how even the electrical outlet is incorporated to make for a larger mirror. It’s easy to hang some command hooks like these hair styling tools! 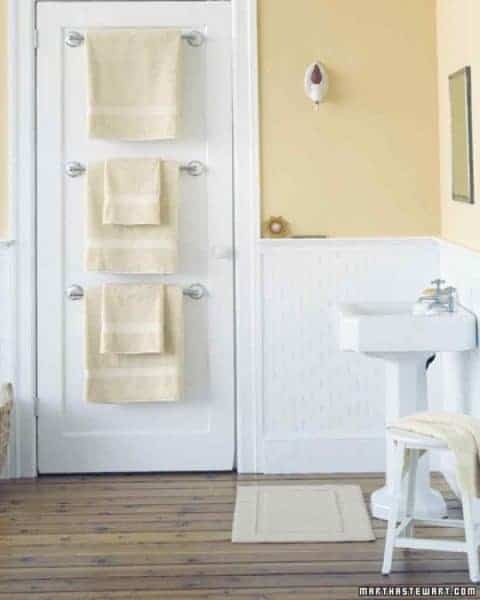 Use small towel bars on the back of a door to create a place for towels. 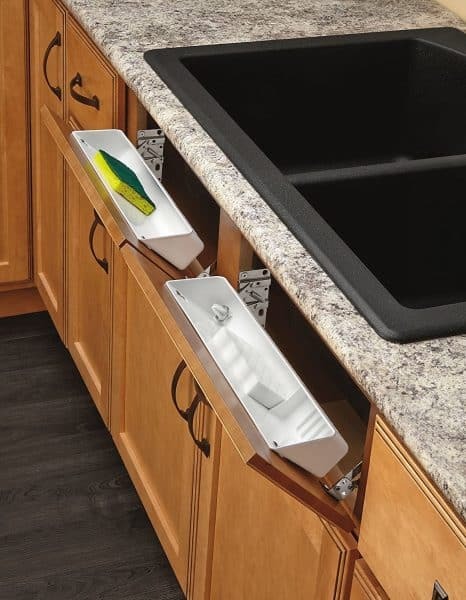 You can even purchase removable ones like these for apartments. We all have tiny items to store. It’s easy to keep small bits and beauty tools in jars. Even better, dress them up in a set of apothecary jars. Another easy way to use jars is to hang them on a shelf. 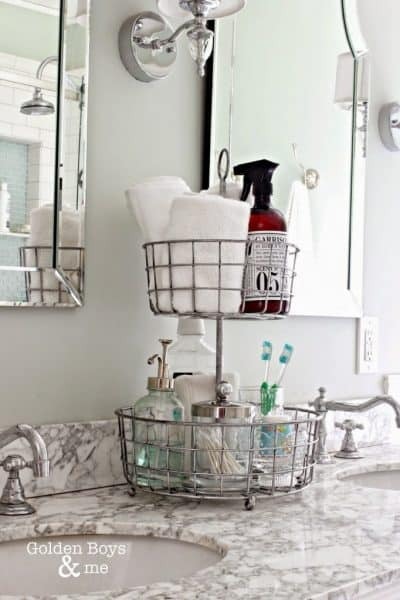 This Mason Jar Bathroom Organizer works very well and a cinch to build with easy to find items. 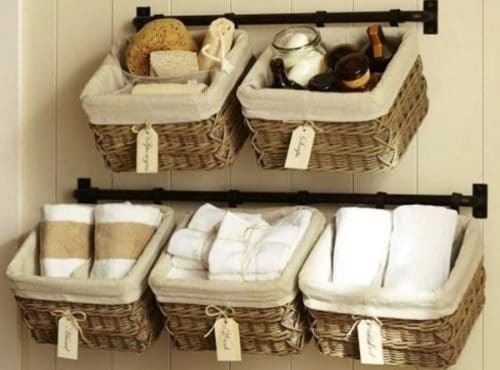 Use crates for inexpensive storage in the bathroom. How pretty is this?! These stacking glass jars are pretty enough to put on the counter and save space. Check out other her other Quick Ideas. Tiered stands make great storage. Check out our other many ideas on using these cute 3 tiered trays. 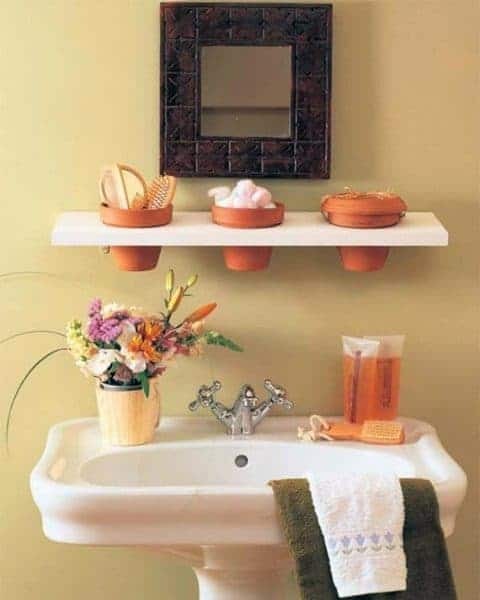 How cute are these flower pots for a small bathroom? 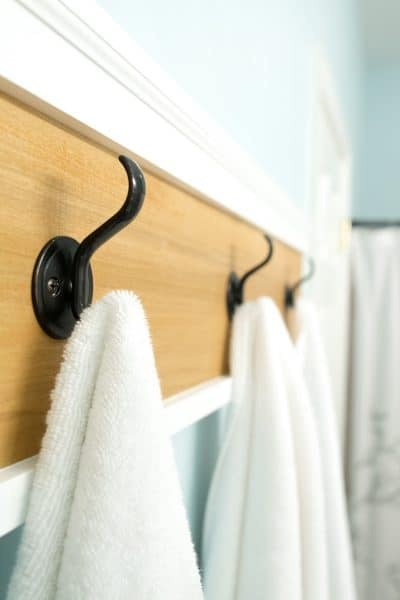 Build an easy Towel Rack to keep towels off the floor. Use every inch of space (even the space above the door)! Love this genius idea. 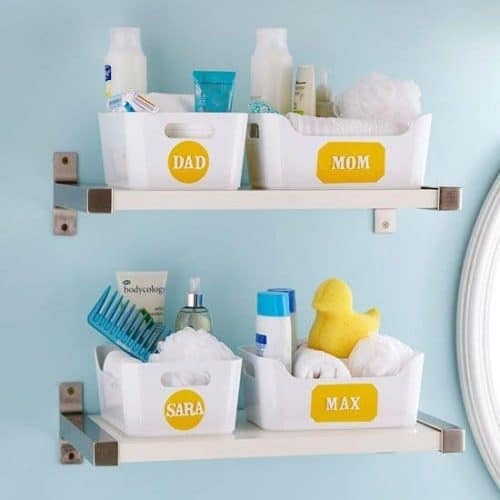 If you are looking for more bathroom organization ideas, our Newsletter Subscribers have access to beautiful custom printable labels and lots more! 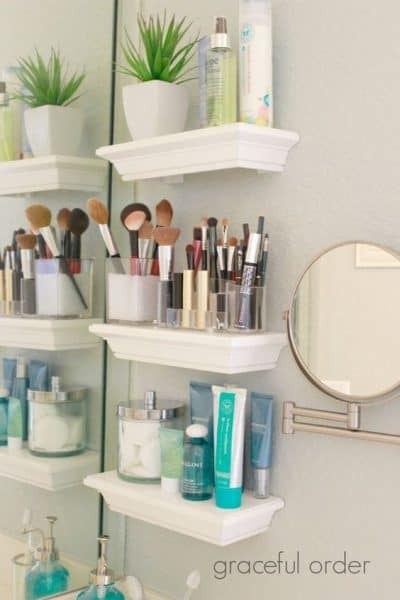 Small bathroom organization is possible. You have can a tiny bathroom and still store all of the necessary tools for prepping and primping. The best tip is to think vertical in small spaces and utilize the walls as well as the floor. 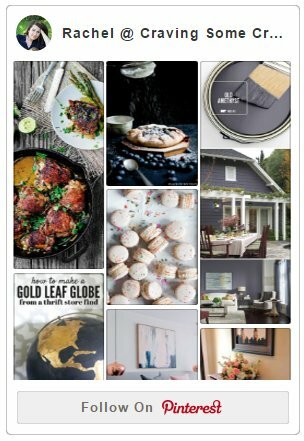 Hope you enjoyed these ideas! Hi, Thanks for the coming to me at the right time. I have been thinking to build up a small bathroom for my kids. I guess your guideline would be helpful to me when I am going for making this. Keep up with good work.